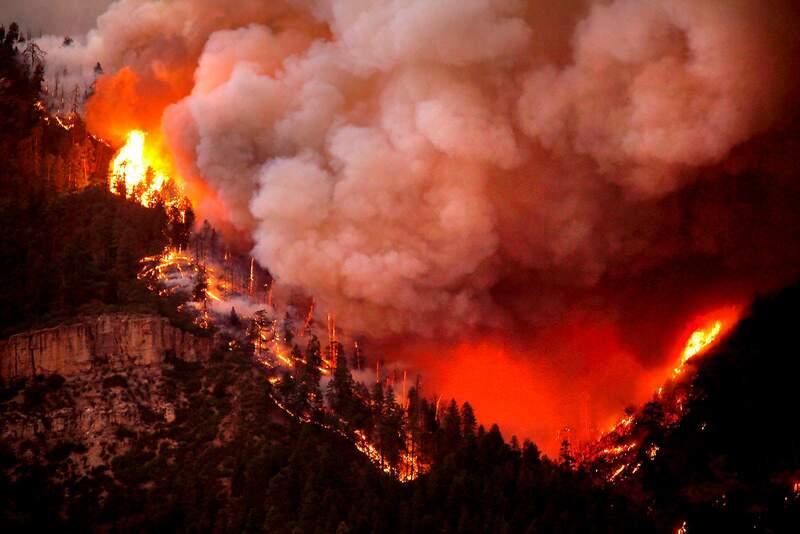 The 416 Fire burns down Hermosa Cliffs on Wednesday night above U.S. Highway 550 on the southeastern side of the fire. 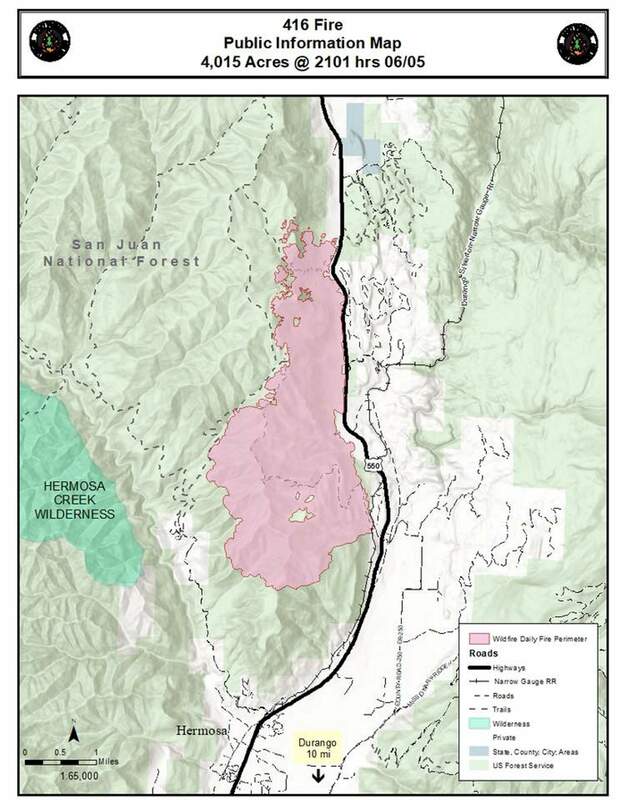 The 416 Fire map shows the footprint as it was mapped on Tuesday night. 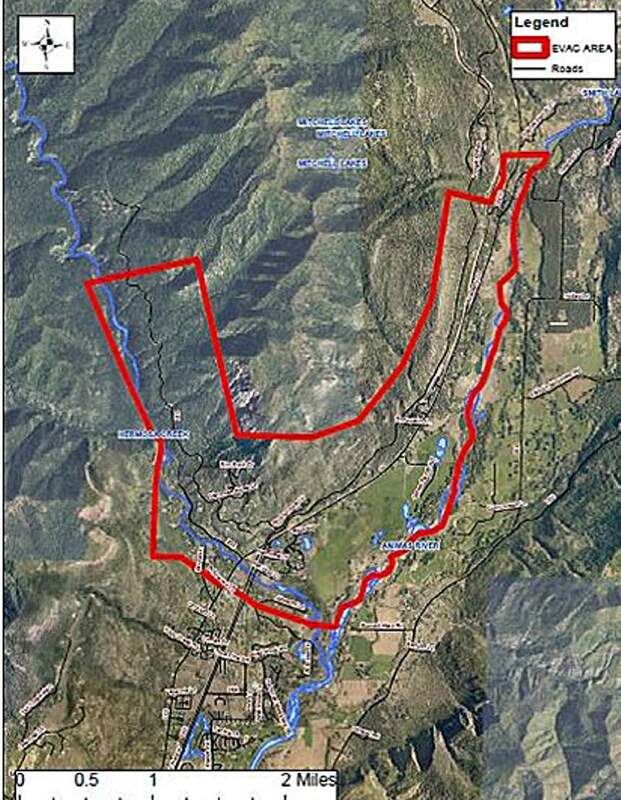 La Plata County has ordered a mandatory evacuation to begin at 6 a.m. Thursday for residences in the pre-evacuated Hermosa area north from Cometti/Mead Lane to the intersection of County Road 250C and U.S. Highway 550. Residents may stay Wednesday night but will be evacuated in the morning. Law enforcement officials will be notifying residents door to door beginning at 6 a.m. Thursday, and a CodeRED notification has been sent to residents. The evacuation also includes county roads 201, 202, the north end of 203 and adjacent neighborhoods. 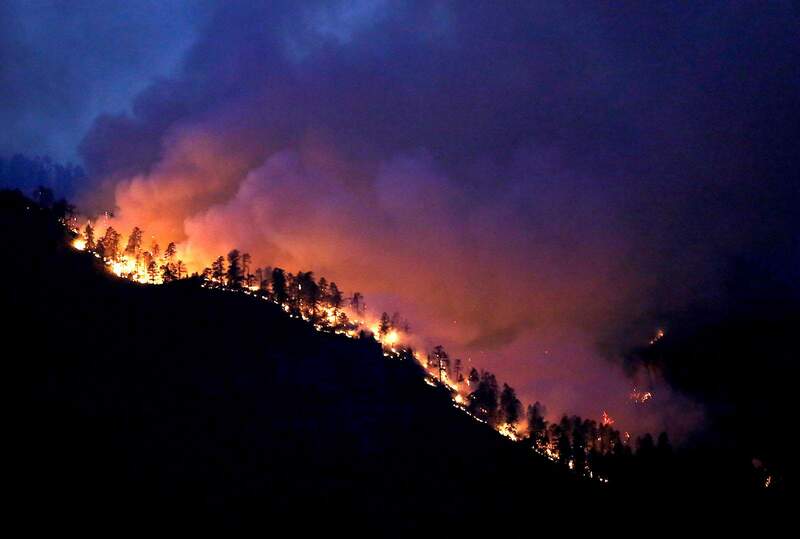 U.S. Highway 550 north will remain closed Thursday until evacuations are complete. The southern road block for the highway closure area will move to the 32.2 mile marker. Livestock can be evacuated to the La Plata County Fairgrounds at 2500 Main Ave. The emergency call center at 385-8700 can help coordinate pickup of livestock. Small animals are being accepted at the La Plata County Humane Society, 1111 South Camino del Rio. Call 259-2847. To receive emergency notifications, including evacuation and pre-evacuation notices, on your cellphone or via email, go to bit.ly/CodeRed_signup. The Hermosa evacuations will be in addition to evacuation orders that remain in effect for about 825 homes north of Hermosa along Highway 550. Late Wednesday night or early Thursday morning, firefighters expect the 416 Fire to reach its way down to the Hermosa Creek drainage, which offers an opportunity to squelch the southwest end of the fire but also comes with the risk of spot fires near Hermosa. “If we can get a hold of the southwest corner of the fire and manage it so it’s not going to go anywhere, then we can devote more resources to the west and north sides of the fire, which is what we really need to do to get this fire under control,” said John Peterson, fire information officer with the Rocky Mountain Region Type 2 Incident Management Team managing the fire. A lot of preparatory work has been done at the bottom of the Hermosa Creek drainage for the expected arrival of the southwestern part of the fire, Peterson said. In addition, fire engines and crews are waiting at the Lower Hermosa Campground to actively battle the blaze. The fire, Peterson said, will tend to want to go back up the drainage once it gets to the bottom, giving firefighters an advantage in fighting it at the bottom. The 416 Fire burns toward County Road 201 on Wednesday evening in Hermosa where dozens of homes and businesses are located. A mandatory evacuation order is in place for the area beginning at 6 a.m. Thursday. Peterson said this activity will be occurring about 1½ miles from Hermosa. “We’re ready to aggressively manage this fire and keep it to the east side of Hermosa Creek,” he said. 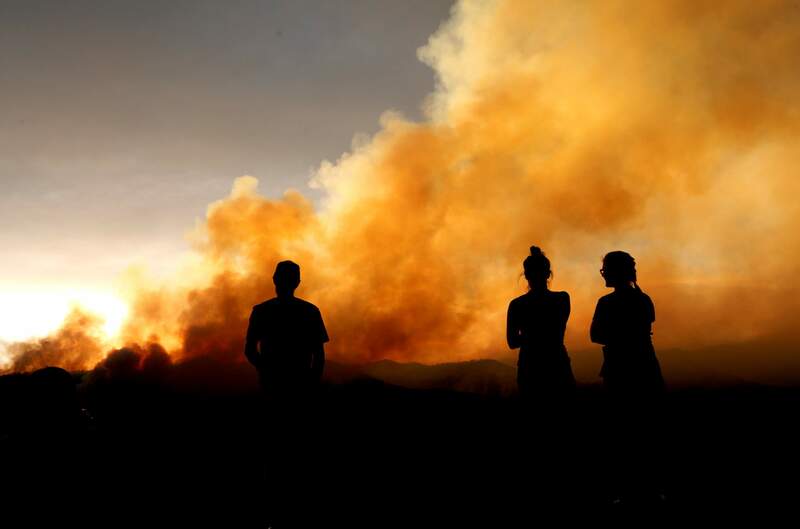 The bad news is that fire conditions Thursday are expected to be the toughest firefighters have faced so far this week – with both hotter and windier conditions in the forecast. “It’s not going to be dramatically worse, but every little bit complicates the firefighting, and were going to have a little bit more severe fire burning conditions tomorrow,” Peterson said Wednesday night. Peterson said firefighters have spent days preparing Hermosa for the fire’s arrival at the drainage. Crews have increased defensible space around structures and put sprinklers on the grounds of some homes that are thought to be the most vulnerable. The sprinklers will be turned on at the appropriate time, Peterson said. Firefighters also battled a 7- to 10-acre spot fire that broke out west of U.S. Highway 550 but east of the fire line Wednesday, Peterson said. But he added no spot fire has broken out east of Highway 550 since the fire first started Friday. A Type I federal firefighting team spent Wednesday mobilizing in preparation to take command of the 416 Fire. The new team will be briefed on firefighting efforts at 6 p.m. Thursday before assuming command at 6 a.m. Saturday. The incoming team will spend Friday “shadowing” the Type II team. A variety of reasons lead to a Type I team to be called to an incident, including size, need for additional resources and threat to structures. San Juan County Sheriff Bruce Conrad issued additional pre-evacuation notices to 34 homes north of the 416 Fire. Previously, the only homes on pre-evacuation notice in San Juan County were in Cascade Village. The 416 Fire was measured at 4,015 acres and containment held steady at 10 percent as of Wednesday afternoon. There were 598 firefighters assigned to the fire. Peterson said updated size and containment numbers for the fire will be available Thursday morning. 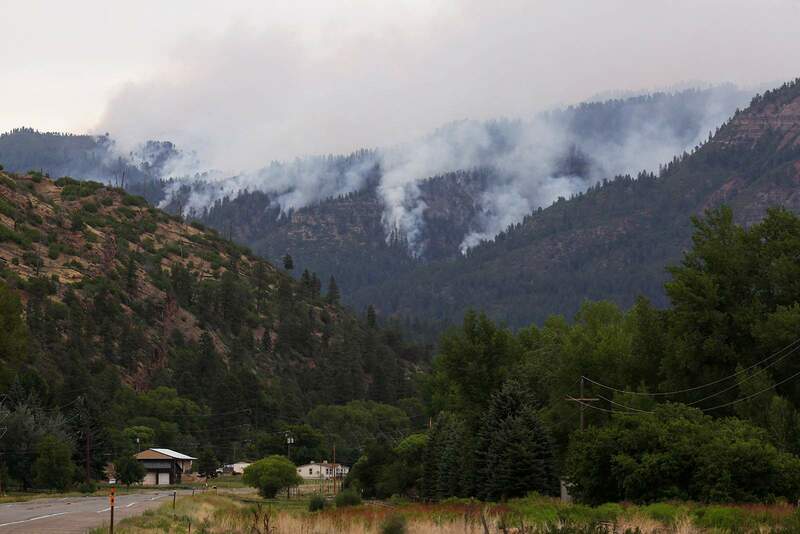 The fire was reported at 10 a.m. Friday about 10 miles north of Durango on the west side of U.S. Highway 550. Firefighters have worked to keep the blaze on the west side of the highway ever since. All properties between mile makers 50 to 54 on U.S. Highway 550, and all of the following roads are on pre-evacuation notice: Lime Creek Road (County Road 1), Cascade Creek Road (County Road 27), Macfiretree Lane, Spud Circle and Mill Creek Lane. The 416 Fire burns long Hermosa Cliffs on Wednesday night above U.S. Highway 550 on the southeastern side of the fire burning toward Hermosa. Silverton held a community meeting Wednesday to update residents. The city of Durango banned backyard fire pits and charcoal grills, City Manager Ron LeBlanc said. The city also prohibits open burning, discharging firearms, launching fireworks and smoking in open space. Residents are allowed to use gas-fired grills. “I would hope the residents of Durango would use common sense and judgment in making those decisions in their home,” he said. Purgatory announced it will open the plaza for the weekend for an assortment of activities. Twilight Lake, across the highway from Purgatory Resort, will also open for kayaking, paddleboarding and other water sports. Purgatory mountain activities, including mountain bike trails, hiking trails, an alpine slide and the chairlift won’t be available. Purgatory’s operating schedule after Sunday will be announced at a later date. Should conditions change, Purgatory’s operations may be suspended at any time. Purgatory Resort has been closed since Friday, when the fire started. U.S. Highway 550 is expected to be open from 8 a.m. to 6 p.m. Thursday with limited access, meaning only through traffic escorted by law enforcement. The Colorado Department of Transportation has set a 10-foot width limit on vehicles going through the fire zone. 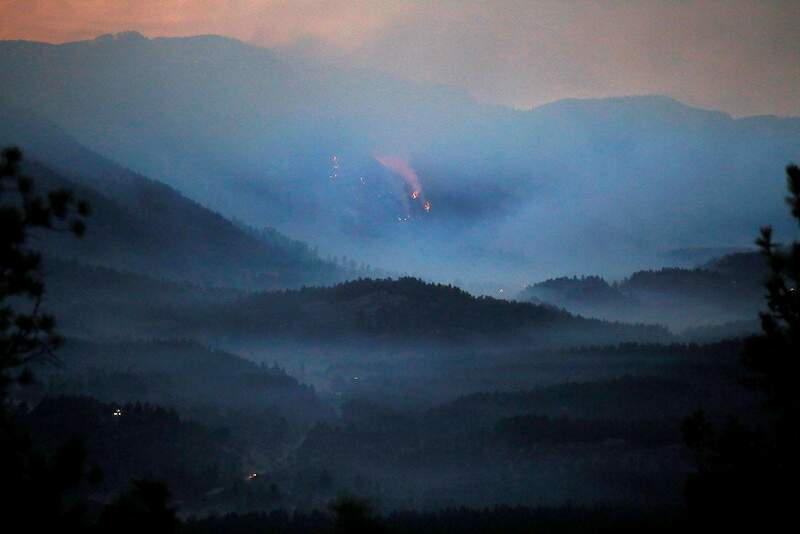 People drove up Missionary Ridge Road to see the 416 Fire burning down Hermosa Cliffs on Wednesday night above U.S. Highway 550 on the southeastern side of the fire. The fire was also burning above County Road 201 on the southwestern side. Residents who are evacuated because of the fire can pick up their mail, which will soon include ballots for the upcoming primary election. If evacuees don’t have their ballot, they are welcome to go to the Clerk and Recorder’s Office and receive a replacement ballot, said Tiffany Parker, La Plata County clerk and recorder. Ballots must be received by the Clerk and Recorder’s Office or delivered to a drop-off site by June 26. Parker said mail-in ballots should be mailed by June 19. After that, they should be hand-delivered to a drop-off site. Flames from the 416 Fire can be seen Wednesday night as the fire burns west of U.S. Highway 550 north of the Glacier Club and Tamarron. While fire and support teams greatly appreciate community support, all food and equipment needs are met at this time, and the interagency effort cannot accept additional donations. Financial donations can be made by calling the Community Foundation serving Southwest Colorado at 375-5807, in the name of the Community Emergency Relief Fund or to the Wildland Firefighter Foundation at https://wffoundation.org/. Winter, snowfall in the Animas River Basin was less than 40 percent of average. This week, Southwest Colorado’s snowpack is just 3 percent of the 30-year average. As of May 29, the weather station at the Durango-La Plata County Airport had recorded 1.41 inches of precipitation in 2018, nearly 4 inches below the average. Donations of clothing and household items accepted at Discover Goodwill of Durango, 1230 Escalante Drive.Financial donations can be made to the Community Emergency Relief Fund by calling (970) 375-5807.Community resourcesLa Plata County government hotline for residents evacuating: (970) 385-8700.Livestock can be evacuated to La Plata County Fairgrounds, 2500 Main Ave.Four Corners Back Country Horsemen will assist with horse and livestock evacuations, call (570) 228-1340.The Browning Ranch in Farmington volunteered to host horses during evacuations. Call Chris Maedche (505) 681-3595.Small animals can be evacuated to La Plata County Humane Society, 111 South Camino del Rio.Tips for pre-evacuationFor people who received a pre-evacuation notice, these steps can improve their safety and expedite departure should an evacuation become necessary.